Increase Sales, Grow Your Business, Run it like a Pro! and achieve the right results! Run it like a pro! Are you getting the most you can out of your sales team? We have complete solutions that encompass all the necessary tools to assist you in building a superstar sales team. Our process goes beyond as we consultant with you to put all the right pieces in place for both you and your team to be effective and at the top of your game. Get everyone focused on the same page with the company goals and direction to drive growth. Leadership and growth go hand in hand. We’ll work with you and your management team to implement the right structure and process that allows you and your management team to take your leadership to the next level and manage your team more effectively to drive growth. As an entrepreneur or sales professional you juggle many different balls which can make business a challenge. Constantly shifting gears from sales, marketing, customer service, book keeping, etc. You literally are the Chief cook and bottle washer. We go above and beyond to assist you in building a solid foundation for growth that creates a sustainable and profitable business. Tools & Resources to learn more and get you started. Great book for sales people, entrepreneurs, and anyone that needs to get results. 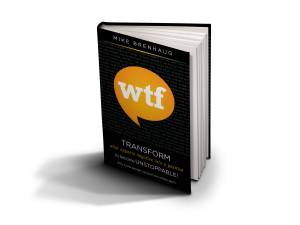 Mike shares in his book how to transform your frustrations into positive outcomes and eliminate the barriers that are holding you back from achieving your goals. More importantly Mike will show you how to Get focused on the the most important and achieve results. – Don Spini – Author of the #1 Best-Seller, Sixty-Seconds to Yes! I’m going to share with you a networking strategy that gets results, saves you time, money, and will have you Focused on relationships that will generate you more business. To build your confidence takes conscious effort and here are 5 tips to help you build your confidence so you can pursue your dreams and goals with determination and drive. How to calculate your sales conversion so you can focus on the most important to increase your sales, achieve your sales goals, and grow your business. How to increase your sales and fill your sales pipeline with a simple 13 new calls a day. How would you like to keep a steady flow of opportunities coming in to fill your sales pipeline with all the other sales activities you have going on? How to make sure your emails land in the inbox and not the spam folder. 10 tips on how to improve your email reputation and get your emails in the Inbox.